Browse: Home / Nic Hannan Music! (October 2018) Looking for an entertaining and recreational way to support local musicians? 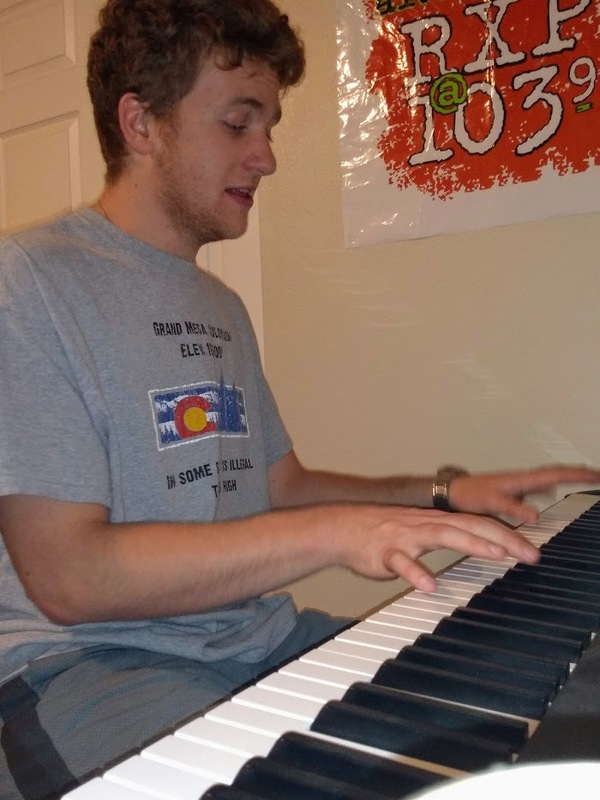 Check out Nic Hannan: a senior Piano Performance Major at Adams State! Nic is a musician who performs around Alamosa to advertise his musical abilities and bless his listeners’ ears with covers and originals. Not only does he perform in multiple ensembles that are organized by the school, including Chamber Choir, Concert Choir, 68 West, and the ASU Jazz Band, but Nic also manages his solo career within the bars and venues in the San Luis Valley. Some of his off-campus gigs include St. Ives Pub & Eatery on Main Street Alamosa and the Mind Blown Dab Lounge in Antonito. On Thursday, October 25th, Nic Hannan was featured on the song “Chango” by Ozomatli (1998), covered by the ASU Jazz Band at the Fall Jazz Concert. During that concert, he also performed songs with the acapella group, 68 West, such as “Try Everything” by Shakira, from the 2016 Disney movie Zootopia. On Friday, November 2nd, Nic will be singing with the Adams State Concert and Chamber choirs in Richardson Hall Auditorium at 7pm as a benefit concert for the Wounded Warrior Project in honor of the 100th anniversary of the end of World War I. Although Nic is majoring in Piano Performance, he is also extremely talented at singing. He has a unique voice with a wide range of notes, and it blends well with the songs he uses for his solo performances. As a big fan of classic rock, Nic’s repertoire consists of covers of Pink Floyd, the Beatles, Randy Newman, and many more rock n’ roll hits. His interpretations of these songs tug at the heartstrings of a vast range of people, from those who grew up in the era of classic rock to young students who enjoy good music from the past and are open to modern music. Nic’s next solo performance will take place at the Mind Blown Dab Lounge in Antonito on Saturday, November 17th for the Growers Cup. Not only does Nic Hannan provide entertainment for his fans, but he also gives piano tutoring and piano lessons. His piano tutoring operates through the school, which is free to students if they are taking the Piano I class at Adams. If a student is not enrolled in that class but would still like to learn how to play the piano, you can contact Nic for private lessons at nichannanmusic@gmail.com. His lessons are $10 for 30 minutes and $20 for an hour, and he is a very patient teacher who will help you extract the most from your time with him! These lessons conveniently take place in the music building on campus. You can also hire Nic for performances! Contact him at nichannanmusic@gmail.com or any of his social media pages for more information about prices. If you are interested in learning more about Nic Hannan, follow him @nichannanmusic on Instagram, or like his Facebook page: Nic Hannan Music. He posts all of his upcoming and past gigs, and keeps his audience updated by posting entertaining videos of current songs he is working on. Give him a listen, and attend his upcoming performances at the Choir Concert on November 2nd, and the Dab Lounge on November 17th!